Tonight is a huge night of boxing, The Middleweight championship of the world will be decided between Sergio Martinez and Julio Cesar Chavez Jr, and one of the biggest names in boxing today, Saul Alvarez will defend his title against the tough, Josesito Lopez. Alvarez has already successfully defended his WBC Light Middleweight title on five occasions, he will aim for a sixth successful title defence tonight against Lopez. The question is, will Lopez provide a tougher challenge for Alvarez than his previous six opponents? Not many of you think he will. 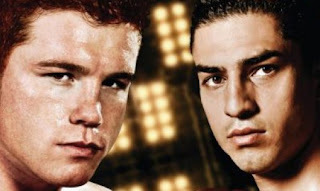 I also think Alvarez wins this fight big, and for the same reason everyone else share that opinion - weight. Lopez is jumping up from 147 (Welterweight) after only having one fight at that weight class. Two fights ago he was a Light Welterweight losing to the likes of Jessie Vargas, he moved up in weight and beat Victor Ortiz fair and square, but jumping up another weight class and challenging a champion who is bigger, stronger, hits harder and more skilled than Ortiz is a huge ask. Alvarez should stop Lopez in the later rounds of this fight, you can guarantee that Lopez will try to win every second he is in the ring, but I think he will be too small. If Lopez somehow wins, he walks into a huge fight with Floyd Mayweather or Miguel Cotto in my opinion. If Alvarez wins, I expect him to fight a Mayweather or Cotto sometime down the line anyway. What do you think of this fight? Can Josesito Lopez have another 'Rocky moment'?